Tax time is fast approaching, which means many of us are busy kicking ourselves (once again) for our lack of financial organization. Every year we swear we’re going to keep track of all our expenses and hold on to every receipt. Well, it’s our belief that if you create a system that is simple and aesthetically pleasing, you can trick yourself into forming smart money-managing habits. 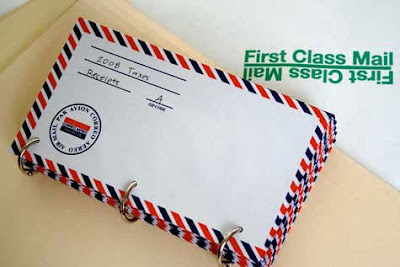 We recently picked up a box of airmail envelopes from the dollar store and transformed them into this handy receipt organizer using a hole punch and some binder rings. Click here to see the full project.